Ask fellow campers about "Napa Valley Expo RV Park" and nearby attractions. The night we checked in, We were told that the site that we had reserved still had an RV in it and that they were going to put us in another site for the first night. A bit of an inconvenience, but they did comp us for that night. There is nothing fancy about this park, However, the sites are very large. Each with a concrete pad and a grassy area. The location of this park makes it worth it. Walking distance or a very short drive into downtown and of course, many wineries to visit nearby. We camped at Napa Valley Expo RV Park in a Motorhome. We came here to wine taste and were a little surprised at how expensive it was. $60 a person to taste 4 wines seems a bit excessive to me. We quickly figured out that the wineries in the are with excellent reviews usually had steep tasting prices and many of them were by appointment only. A little different than the Paso Robles area that we usually taste at. We will come back again but will do our homework first when it comes to tasting. Jax Cafe had a great breakfast! This park is just a parking lot at the Expo Center (like fair grounds). RV park part is nothing special. But the location is great, right in town. The pads are huge and paved, very nice with full hook ups. Very clean and well cared for, with convenient garbage. Seemed like the garbage and recycle bins were always empty. The bathrooms were open 24 hours and were very clean and surprisingly nice. The hot water started to run out for me at the end of washing my hair. But never went cold, just was less hot at the end. The "office" situation is a little odd. You mostly have to work with the camp host, next to the office. Off hours there is usually someone around on a golf cart. We did not find it hard to find someone to help us when we needed it and staff was very nice and helpful. Backing in was tight, but the staff moved the garbage bins and helped guide us in so was not a problem. Wifi was a little weak for me, as I worked some days. But cell service was great and I used my hot spot. No problems. We have Verizon. 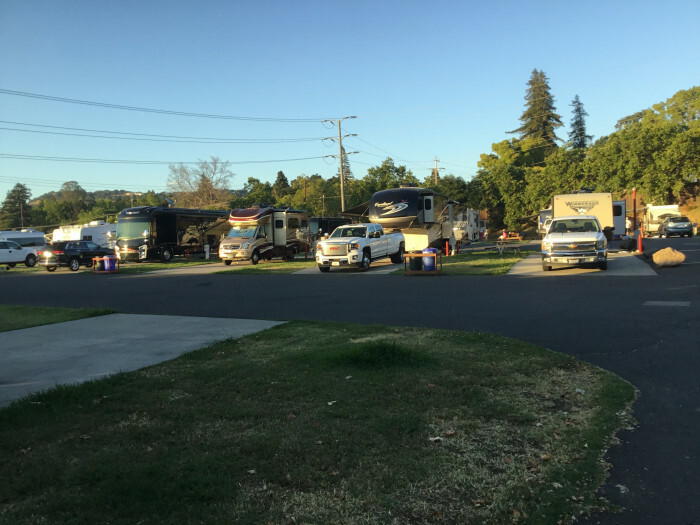 If you are looking for a nice clean rv park in downtown Napa, this will meet your needs. We camped at Napa Valley Expo RV Park in a Fifth Wheel. Very close to stores, restaurants, downtown. Very convenient location. Very small park. I mean really small. 16 spots but nicely spaced apart, clean, lots of grass. Close to great eating and shopping in old town plus wine tasting etc. And the Napa Wine Train... We were there for Thanksgiving with family in the area but will for sure go back in the spring time or fall. Park manager says make reservations far in advance. They are popular and small......small in all caps would be appropriate. We camped at Napa Valley Expo RV Park in a Motorhome. Very clean park just within walking distance to downtown Napa. Almost level concrete sites. Very friendly camp host. They raised their prices from $50.00 per nite to $60.00 so it's not quite the value it once was. I have already have reservations for next year. For a great dining experience, try The Oxbow Market. Thanksgiving weekend, packed and very festive. We camped at Napa Valley Expo RV Park in a Motorhome. You are within walking distance to Napa. Level concrete pad approximately 65 feet long pull through. Good Wi-Fi most of the time but does get busy. Electric voltage is constant. We camped at Napa Valley Expo RV Park in a Motorhome. You are in one of the greatest wine areas in the country. Park appeared to be best choice in Napa. Paved roads and concrete level sites. Smaller property so call in advanced. Water pressure low. My RV pump was better. We camped at Napa Valley Expo RV Park in a Fifth Wheel. Pulled in here way after hours. Next day I tried to extend my stay, but they could not accommodate me. VERY nice camp host and reservations staff helped me find another campground in the area. Campground is nice with huge sites (just not too many of them), grass, and it was pretty quiet. Concrete site was 70+ feet long and pretty level. GREAT place to stay when in the area. We camped at Napa Valley Expo RV Park in a Motorhome. Stayed here to enjoy Napa and tour the wineries. Excellent location convenient to everything. Clean, huge, level sites. Rather open and no specific amenities (pool, store, etc) but wasn't staying there for that. Wonderful, helpful camphosts. We were unfortunately there during the fires however the camphosts kept all aware of everything so we were certain to be safe. Additionally they provided accommodations for evacuees and first responders. Wonderful place and absolutely hope to return there. We camped at Napa Valley Expo RV Park in a Motorhome. Watch for entrance - easy to miss. This is a TINY park tucked into the heart of Napa, California. It has just 30 spaces, and I was lucky enough to get the last available space when I booked two weeks in advance. The park is well designed, and well maintained. There is a bit of road noise from a busy street bordering the park, but the park itself is very quiet. The pads are concrete, with a picnic table available. Shade is minimal, but the excellent weather in Napa during our stay rendered this unnecessary. I had a 45' back-in site, and it was tight parking my truck after disconnecting and auto leveling. The utility hook-ups are located in the middle of the site, so my water hose and electrical cable were at maximum length to reach my connections. Sewer for my trailer was a short run, but if your sewer hook-ups are in the rear, it may be a stretch. We camped at Napa Valley Expo RV Park in a Fifth Wheel. Napa is wine country. If you want a treat, try the Napa Valley Wine Train. Great fun, great food, but pricey. This park was better than we had expected, very neat and clean with grass between the sites and very level concrete pads. Utilities all worked well with great water pressure. The entrance is narrow and a bit dicey as previously noted, so go slow entering. Our only complaint was the Camp Host, who was not in the office, so we went to the sign indicating his residence within the park. When I knocked on his door he opened it with a "Ma'am, there is a doorbell!" Not very friendly and I was not the only one to make this "mistake!" Regardless, we would definitely recommend the park for anyone wanting to visit Napa. We camped at Napa Valley Expo RV Park in a Motorhome. This is a very nice and clean park and the camp host is very friendly. We usually like to stay at state parks and campgrounds where we have some privacy between sites, but this is more of a typical RV park with no privacy between sites. It was pretty much the only option though for visiting the Napa area. The location was great! Walking distance to Oxbow Market, close to the Napa wineries and not far from Sonoma. Close to Six Flags in Vallejo and Jelly Belly Factory in Fairfield. Verizon and AT&T worked very well. We camped at Napa Valley Expo RV Park in a Fifth Wheel. Part of the Expo grounds in downtown Napa. Weak unsecured WiFi. Grass between campers with concrete pads. Trash cans overflowing with trash blowing all over the campground. Only one camp host, who is overwhelmed. We camped at Napa Valley Expo RV Park in a Fifth Wheel. Downtown Napa just a few blocks away, lots of traffic even during the day. 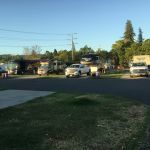 This is a small, flat, open, paved RV park within 0.6 mile of downtown Napa. Check-in was great by the friendly camp host. Sites are large clean concrete pads. I needed one Lego block to get level. WiFi was satisfactory. The open space worked well for satellite TV. We scanned 40+ OTA stations, most either Chinese or Vietnamese-based. Laundry was 2 washers and a double dryer, but worked satisfactorily at $1.50 to wash. Plenty of space for pet walking, as the park is situated near/in the Expo. Plenty of trash and recycling bins were provided. The Park is extremely clean. Utilities worked fine. Very good value for exploring the Napa Valley. We camped at Napa Valley Expo RV Park in a Travel Trailer. Enjoyed our lunch at Gott's Roadside Diner, just past Oxbow Market. After rereading some of the other reviews, I feel like we were in a different park. Certainly there is no question that this park is a fabulous location for a reasonable cost. Our spot was level and did have grass between spots. The camp host was very helpful and accommodating. But the noise level was really disturbing--the county seemed to spend all its maintenance dollars on tractors and leaf blowers to clean out the livestock pens, starting at 6:30 AM several mornings and continuing all day every day. The grass was not mowed the entire week we were there, and it was tall and unkempt. The trees were shedding leaves and fruit, and were left where they fell. I don't know what other campgrounds in Napa are like, but we would certainly check them out first before we returned here. We camped at Napa Valley Expo RV Park in a Motorhome. So convenient for Napa wineries and 25 minutes away from Vallejo for ferry to San Francisco. Walk to downtown Napa for restaurants, shopping. For little kids, Sonoma Train Town is really great. It's a relatively easy walk (1/2 mile) to the Oxbow Public Market. On busy days (especially when the Farmers Market is there also), it can be impossible to find parking at the market, so walking is a good alternative. There is a Shell gas station just a couple blocks south of the RV Park on Silverado Trail. It has plenty of room to accommodate big rigs and seemed to have some of the lowest gas prices in Napa. Great location for visiting the wineries in NAPA Valley. Go to Ca' Momi for pizza in Napa and don't miss the duck fat french fries at Goose and Gander in St Helena. To die for. We recommend the Oxbow Public Market. Lot of high quality food, but pricey. The Uptown Theater is a great venue for shows and concerts. Are you affiliated with Napa Valley Expo RV Park ?